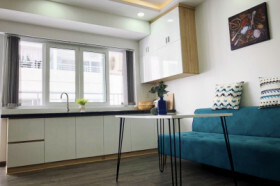 The apartment is in 5-star building Muong Thanh Vien Trieu (1 Pham Van Dong Street, Nha Trang). 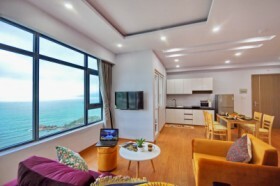 Beachfront is an apartment located on the 17th floor. 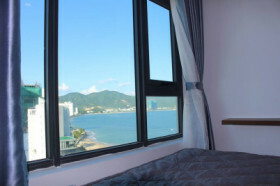 From both living room and bedroom, you can contemplate a gorgeous view to the sea, the mountain and Nha Trang City. 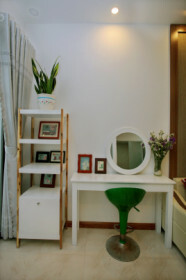 Staying in our apartment, you will have everything you need to make you feel like your home. 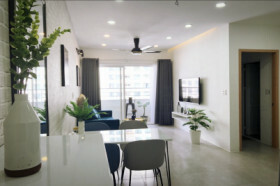 With 2 cozy bedrooms, 1 spacious living room, 1 modern kitchen and 1 lovely dining table, this is a great place for you and your family's trip to Nha Trang. - If you want an early check-in and late check-out, please don't hesitate to let us know. - I am always available on phone/ Line/ Viber (24/24) so if you need help, feel free to contact me and your problem will be solve quickly. Besides, my assistant lives in the same building so he will support you during your time here. He also can speak English and Chinese. - I will offer you a map on arrival and explain to you all what you should do or see in Nha Trang. - I’ll take you to rent a motorbike on arrival. - You will be given a phone with a Vietnam number, so you can contact me anytime. I will answer all your questions during your time here. Moreover, I will come and see you regularly to see if everything is fine.